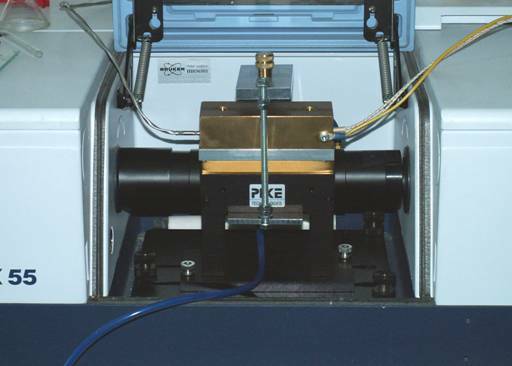 Combined diamond ATR and optical fiber probe for the synchronous measurement of mid- and near infrared spectra of solids. Gas input and output ports allow for the real-time monitoring of hydration / deuteration, adsorption or drying processes. The cell couples two FTIR spectrometers, optimized in the mid- and near-infrared regions (not shown). Synchronous mid- and near- infrared study of stepwise dehydration and deuteration of a hydrous phyllosilicates mineral. Micelles (or colloidal particles) are formed when a sufficient number of amphiphilic (macro)molecules are dissolved in a solvent that is good for one of its parts and bad for the other. The part avoiding the solvent forms the nucleus of the micelle. In contact with the colloidal solution, a solid surface with affinity to the nucleus will cause adsorption of the micelles and their relaxation to maximize their interaction with the surface. Controlling the adsorbed layer, which is typically thinner than 100 nm, is important in designing modified surfaces in terms of wettability, friction, adhesion, corrosion, optical properties, biocompatibility etc. At TPCI, we employ Attenuated Total Reflectance (ATR) in the mid-infrared to monitor in real-time the adsorption of micelles on solid surfaces in the presence of the colloidal solution. The technique is suitable for both aqueous and organic systems. It offers temporal resolution of a few seconds and long term stability of several days. Unlike force measurements, ellipsometry or surface plasmon spectroscopy, the technique monitors the evolution of the vibrational spectrum of the adsorbed layer. Thus, it is particularly sensitive to subtle changes in local order or chemical interactions accompanying adsorption. It can be used with polarized light to study molecular orientation effects. Adsoprtion from a colloidal solution of the diblock copolymer poly(tert-butyl styrene - b - styrene sulfonate), PtBS41-PSS830 (100 ppm in 0.5M NaCl/H2O), on the surface of germanium. The spectral evolution during the first hour of a 5-day experiment is shown (from back to front). 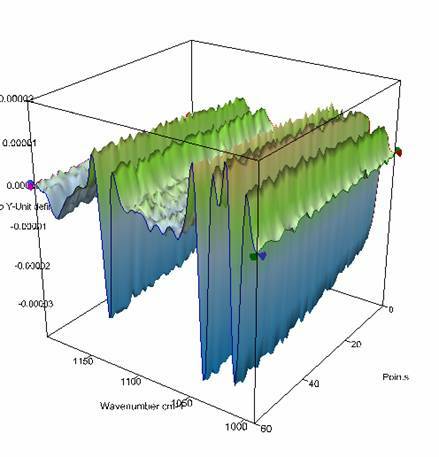 The spectra have been measured on a 6-reflection ATR accessory mounted on a Bruker Optics Equinox 55 FTIR spectrometer. The 2nd derivative spectra are used for monitoring adsorption in order to enhance the resolution of the sharp localized sulfonate and para-substituted ring vibrational modes from the much broader spectrum of water. Excess surface densities, Γ, can be calculated from Infrared absorbance data and extinction coefficients defined from transmission measurements. Although adsorption is monitored via the sulfonate groups attached to the hydrophilic (PSS) block, the thickness and growth rate of the adsorbed layer depend, for a given concentration, on the presence and relative length of the hydrophobic (PtBS) block. Macromol. Symp. 205, 117 (2004).